Sticking with the 'Family' theme, I had my little helpers make it a family card. We made a Fish card because as a family we love to go fishing!! My little boy 'helped' put the blue circle through the Cuttlebug to emboss it. My little girl 'helped' ink the edges of the card (she picked the color and didn't want any ink on the top). :) My little boy 'helped' stamp the top sentiment (hence the blur). My little girl 'helped' me stamp the bottom sentiment. We had fun!!!! I can't remember where I found the card base, I do know I welded two together on my Gypsy to make it a card. Make sure you go over to Sweet Magnolia Rose to enter a project! :) Thanks so much for stopping by!! Wow, It's Monday!!!! I hope everyone had a wonderful weekend!!! This weeks challenge over at Scrapbookaholic by Abby is to create anything Spring! Abby is sponsoring the giveaway for this challenge (thanks Abby). She'll be giving away a 6x6 SEI paper stack and SEI assorted ribbon (I wish I could enter). :) So make sure you create anything Spring for the challenge. You'll want to hop on over to Scrapbookaholic by Abby to see what the other DT members have created and to enter your project! I hope you are able to craft a little today (maybe even use some of those scraps)!! :) Have fun!!!!!! FIF Birthday Bash Bunny Blog Hop! HELLO FRIDAY!!!!!! Anyone else in need of a Friday?! I'm so happy you're here (both you and Friday)! Welcome to Flaunt It Fridays Birthday Bunny Bash Blog Hop!!! :) I hope you came after visiting Amanda at My Scrappin Obsession. Didn't she do such a great job?! She's so talented!! If you just happened to visit my blog for the day, make sure you start at the beginning at Flaunt It Fridays. :) You'll want to make sure you visit everyone and leave a comment at all of the blogs to be eligible for the Grand Prize - a Peachy Keen Wide Eyed and Bushy Tailed assortment! YEAH!!! I kept this one super simple. I used Create A Critter for the Bunny as well as for the present. The ribbon and the frame were from my stash, I'm not sure where they came from. I did use some flocking for the bunny (just to add a little bit to it). For my second project we were supposed to make something using a different cut from Birthday Bash. Looking through the images online, I found a cute little snail that was holding an envelope. It inspired me to make this card. I used Base Camp for the card shape (to look like a stamp). The snail is from Walk In My Garden, and the grass is from Paper Doll Dress Up. :) I inked around the grass, the snail and the base paper to give a little bit of dimension. The stamped message is a My Pink Stamper stamps. Your next step is Carley at The Real iCarley. You will LOVE what she has in store for you!! 11. Carley <------- You're Next Step!! Ok, I'll share the winners first. happy anniversary you look so pretty. crafting, my cricut and of course friends like you from the blogging comm. Beautiful card Celeste. I love the purple paper with the white flowers. All of the images were cut from Camp Out. It's an oldie, but goodie!!! :) I can't remember sizes; I used my Gypsy to size them to fit perfectly. The smoke/cloud with thank you was done by hand. Happy Monday!! Can you tell I'm super excited about this?!!!!!!!!! This is the very first Scrapbookaholic by Abby Challenge!! WAHOOOO! This week the theme is 'Pick Your Own Holiday' (think of the possibilities)! You can find several ideas for holiday by clicking here or any other website that shows national celebrations in March. The card is a normal A2. The apple is from Preserves cut at 3.25 (I tried some of the doodling/stitching - what do you think?). I found this phrase and just wrote it on a scratch piece of paper. The background paper is from Cosmo Cricket Garden Variety stack. 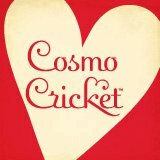 This actually leads me to the sponsor of the challenge this week . . .Cosmo Cricket!!! If you're looking for my Spring Forward Blog Hop scroll down or click here to go to it. I'm so excited to be a part of Jen's blog hop. I hope many of you know Jen at The Purple Scrapbooker, if not - you really should!! She's so amazingly talented; I'm so honored that she let me be a part of her Birthday Blog Hop! HAPPY BIRTHDAY JEN!!!!!! To help Jen celebrate her Birthday I have a small present for one lucky person. Well, now that you've seen my card for Jen's Birthday the next step is to go visit Cheryl at Cards by CG. You will love what she has in store for you!!!!!!! Cheryl - www.cardsbycg.blogspot.com <------ You're next step! Thanks again for stopping by. A big thanks to Jen for letting me be a part of her Birthday!!! Hello my wonderful friends!!!!!!! Welcome to the Spring Forward Blog Hop. This hop is themed around Easter or Spring. Well, I did a little bit of both. :) For those of you that know a little about me, I often 'craft' with my little ones. So, for the first project I went for Easter themed and had a 'little' help. Every year we do a scavenger hunt for my little ones **by we, I mean me - I get to create the hints because hubby can't rhyme to save his life**. :) LOL! This year I decided to let my little ones help (and they didn't even know it). I printed off eight egg shapes (using word) and had my little ones color them. We then cut out the eggs (with child friendly scissors of course). My second project was a fun little Easter/Spring card. I love to be in blog hops because I get to give things away. :) Since I wish everyone could win, I decided everyone could. I've decided to give everyone a PDF copy of the Easter Basket hints and the eggs to color. Click here to download it. :) I know most of the hints are fairly simple (for younger children), but I am more than happy to help anyone think up some rhymes for your own scavenger hunt. If you'd like help, just leave me a comment asking for help. I hope you enjoy these!! Now that you've seen my projects I'm going to send you on to visit Karel at One by One the Flamingos are Stealing My Sanity. You'll love what she has in store for you!!!!!! Thanks for stopping by!!! 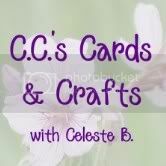 Celeste B. at http://ccscards.blogspot.com/ <-----You Are Here!! Karel at http://karelj.blogspot.com/ <--------- Next Step!!!! I'm so excited!!!!! 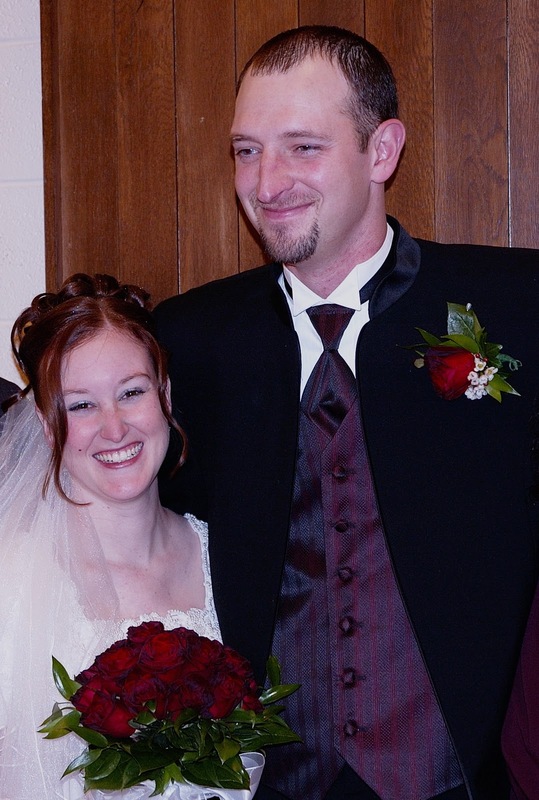 I tried having this post ready before my anniversary (but that didn't work). :) I'm so happy to let all of my friends know that I am now part of the Scrapbookaholic by Abby Design Team!!!!!! Make sure you stop by Abby's blog (click here) to see the rest of the DT! There will be lots of challenges and hops coming up; along with some amazing sponsors. Go check out the rest of the DT! Thanks again for the opportunity Abby!!!!! This one was a lot of fun to make. I have all of the info over on Jen's blog (click here to visit Jen). Before you run away, I just wanted to share one more thing. :) Today is my anniversary!!! :) Six years ago I married this wonderful man!!!! (Isn't he handsome!!!) I'm so thankful for everything he's done for me (and our little ones) and the great years that we've had (with many more to come)!!! In celebration of my anniversary and the opportunity to do a guest post on Jen's blog, I'd like to give away a copy of a clean romance novel called 'Catch the Morning Star'. It was written by Ruth Davidson, who happens to be my wonderful Aunt (love you Ruth)!!! You can check out more about her books by clicking here. Her books are beautiful and clean and make your heart smile! Just leave a comment here telling me about your loves and I'll pick a winner on March 14. Again, big thanks to Jen!!!! I'm so happy I got to do a guest post!!! Thanks so much!!! To my hubby - Happy Anniversary my LOVE!!!!! I LOVE FIF!!!! These are so much fun; and always such a challenge (in a good way). This week at Flaunt It Fridays the challenge is to use the little ballerina dancer on Twinkle Toes. She is adorable, but unfortunately I don't have the Twinkle Toes cart. In place of the dancer I used my trusty Paper Doll Dress Up cartridge with the little dancer. Isn't she cute?! She was cut out at 3. I used a PK Princess face for her (of course) and just used colored pencils to brighten up her cheeks and lips. :) I added a bit of bling to her waist (because everyone needs bling). :) The word 'Dance' was cut from Ashlyn's Alphabet cartridge at 1. The rest of the phrase was printed off on my computer. The phrase is one that my family and I live by. We dance while we do chores and we really love to dance for fun too (anyone else play 'Just Dance 2' on the Wii?)! I used my Crop-o-dile to punch holes and add the eyelets that the ribbon went through. Like most times, I can't remember where the background paper came from (sorry). Make sure you stop by Flaunt It Fridays to see what the other DT members have created. We'd love to see what you make for the challenge so make sure you link it up!!! Hi Friends! I hope everyone is doing well!! :) This card was made for my Dad's Birthday. Here's a card I made for my neighbor. She lost her Mom and has been going through a rough time. I just wanted to let her know that we were thinking about her and her family. I made it more as a 'Just a Note' instead of a 'Sympathy' card.